More treasures from the archive of papers left by philosopher Elizabeth Anscombe, edited by her daughter and son-in-law, philosophers Mary Geach and Luke Gormally. This volume collects a number of published and unpublished papers by Elizabeth Anscombe in which she engages with the thought of major philosophers of the past. 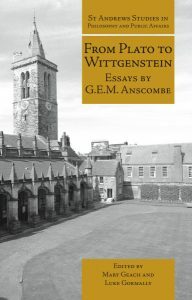 Philosophers featured include Plato, Anselm, Aquinas, Descartes, Hume, Spinoza, and Wittgenstein. Find it here.